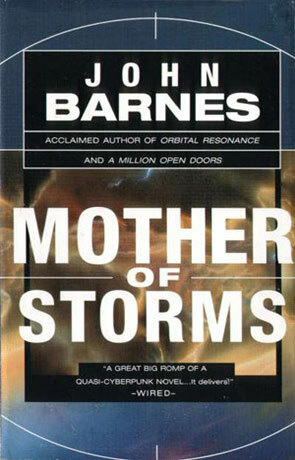 Mother of Storms is a science fiction novel by the author John Barnes. I read an article recently saying that the big difference between old (anything not from the last ten years, I guess) and new science fiction is that the old stuff is more about technology and the new stuff is more about people. There's some truth in that, if you ask me, there's lots of exceptions, but basically there's some truth in it. You can turn it around if you like and say that in the old days the character where flat and two-dimensional and that the science is neglected and faulty in the new stuff. So why am I telling you this, you ask? Because some of you out there like the old stuff (give me science, I hear you cry) and some of you like the deeper characters of the new stuff. But why should we have to choose? I want both! Mother of Storm is one of those rare books that will give you this. Old style technology and science combined with characters that actually matter and that you can care about. Mother of Storms tells a couple of different, yet entwined, stories on the backdrop of The Big Eco Disaster. A lot of methane is released from the ice on the bottom of the ocean (I actually just read an article about this in the November 1999 issue of Scientific American), resulting in an accelerated greenhouse effect, resulting in warmer seas, giving us lots and lots of hurricanes. And not just small hurricanes either, no, we are talking several hundred kilometers wide and with wind speeds close to the speed of sound. Bad things are going to happen. We follow an enhanced (in more than one way, nudge-nudge) media starlet as she become a refugee in Mexico. We follow the last man in space as software optimisers invade his brain and change him into something else. We follow a patent-pirate as he tries to make a (very large) buck out of the situation. A young man going to Mexico to forget, the president of the US, her right hand (with a big bad secret), an old-fashioned journalist, the father of a raped and murdered fourteen year old, a meteorologist and his family, just to name the main characters. Mother of Storms isn't the kind of story that leaves you breathless with amazement, but it is a very well crafted and executed story that I'm very hard pressed to find anything wrong with. Probably one of the best Eco-disaster books of the 1990s (lots better than the bit of David Brin's Earth that I managed to read before it bored me into a four-week coma). Written on 1st January 2000 by TC.